Plastic packaging from British recycling bins has been found discarded at multiple illegal dump sites in Malaysia, a joint investigation by Greenpeace’s Unearthed and The Daily Telegraph has revealed. The news comes as the Environment Agency is embarking on a major investigation into claims of fraud in the UK’s recycling exports system, including allegations that exported UK plastic waste is not being recycled. Unearthed can now reveal it found brands familiar to UK supermarket shelves strewn across a vast pile of rubbish standing 10 feet tall on a site measuring nearly three acres, located about an hour’s drive from the Malaysian capital of Kuala Lumpur. The products included Fairy dishwasher tablets, Yeo Valley yoghurt and Tesco Finest crisp. In an adjoining recycling facility that has been closed for months, reporters also found ripped-open recycling bags from UK local authorities, discarded in a huge pile of plastic bags, alongside yet more food packaging from the UK and across Europe. In nearby Klang, home to Malaysia’s largest port and the entry point for most imports, investigators found sacks of discarded European and British plastics in a largely abandoned industrial complex, where piles of rubbish are routinely dumped and burned by the roadside, billowing acrid clouds of smoke. In Ipoh, about 140 miles to the north, Unearthed found Tesco’s carrier bags and packaging for McCain’s oven chips, Yazoo yoghurt drink, and Heinz baked beans alongside Australian household plastics and factory offcuts piled 20ft high. Milk bottles and shreds of bags floated in stagnant pools of water at the feet of the piles. Satellite imagery shows the dump has mushroomed in the past year. The UK exports around twice as much plastic packaging for recycling as it processes domestically – almost all of it to Asia. For years, most of this went to China, but since China banned these imports at the start of 2018, Malaysia has become the world’s top destination for plastic for recycling. 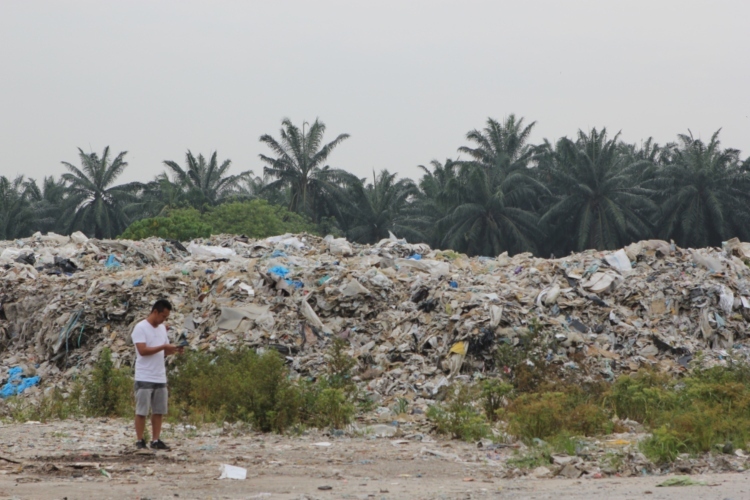 Between January and August 2018, the UK exported over 88,000 tonnes of plastic scrap to Malaysia – more than a quarter of the UK’s total plastic scrap exports. At the same time, the country has been inundated with plastic scrap from around the world, overloading its waste management system. “It’s nearly a year since Michael Gove said Britain must stop offshoring its dirt, yet Britain is still behaving like a long-range fly-tipper, shifting the environmental and social costs of our addiction to single-use plastic to communities all over South East Asia,” added Louise Edge. Exporting waste that cannot be recycled is illegal in all but a few circumstances. Under EU recycling rules, materials can only be exported for recycling if they will be treated in broadly equivalent environmental conditions to how they would be handled in Europe. But Unearthed saw multiple sites where household plastics bundled for recycling were stored outside in tropical conditions that experts say render them largely unrecyclable. Read the full investigation by Unearthed here. Pictures: Stills of some of the British plastic waste and illegal sites found during investigations can be downloaded here. Please note the folder names indicate who the pictures should be credited to, either Greenpeace or Jules Rahman Ong / Greenpeace.